PRK - photorefractive keratectomy was the first surgical procedure, where laser was used to shape the corneal surface. 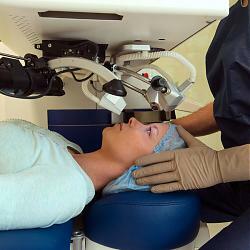 The same type of laser is used for PRK as for LASIK operations. The most important difference between the two procedures is the way of how the middle layer of the cornea is exposed. During PRK, not a flap is cut open, but the surface layer, epithelium, is mechanically scraped off using a special instrument. Epithelium is not placed back after refractive surgery. MYTH: No-touch or "no-cut" laser surgery is a procedure where no incision is made upon the eye and no scar develops. A: No-touch or no-cut procedure is a PRK that is performed with a laser. During this procedure, an epithelial flap of about 8mm in diameter is removed with a laser and the cornea is polished. Then a contact lens is placed on the eye for 3-5 days for wound healing. With the LASIK procedure the edge of the epithelial flap may be visible after many years under a microscope, but after the no-touch procedure, it will not be visible. On the other hand, for adjustments of higher minuses and/or in cases of poor healing of the cornea, in the no-touch procedure corneal scarring may occur, causing a decline in transparency and reduced quality of vision. LASEK - Laser Epithelial Keratomileusis was an modification of PRK method. During LASEK the epithelium layer is loosen from the tissue below with alcohol and is moved aside for the time of the surgery. The replaced epithelium layer will act as a natural contact lense. Epi-LASIK (Epi-K) is the method for removing epithelium. Epithelium layer is separated from below layers by using a special microkeratome. As the remaining epithelium cells are not damaged by alcohol or mechanical scraping instrument, the recovering of the eye after Epi-K method is faster and the chance of arising haze is smaller then with using PRK or LASEK method. ASA (advanced surface ablation) is the newest method of epithelium removal where the epithelium is removed with laser impulses. Initially this method was designed for the treatment of corneas with an especially uneven surface by the Italian company iVis Technologies. Today there is no scientific study-based evidence that ASA gives better results than PRK or Epi-K in the case of normal corneas. As the total amount of laser energy falling on the eye increases by about half due to epithelium removal, this may cause more severe inflammatory reactions after the procedure compared to the PRK or Epi-K methods. The main technical difference between laser surgery with epithelium removal (PRK, LASEK, Epi-K and ASA) and femtoLASIK lies in the way the ablated part of the cornea is exposed. With the Epi-K method the epithelium is pushed aside with a plastic blade, while with the ASA method the epithelium is removed with laser impulses and then the main layer of the cornea is smoothed out with the laser. During the femtoLASIK procedure the incision is done some microns below the epithelium, in the main layer of the cornea, and the flap with the preserved epithelium is turned aside. The epithelium preserved during the procedure ensures the rapid restoration of vision and painless recovery characteristic of the femtoLASIK procedure. During all procedures with epithelium removal (incl. Epi-K and ASA), a contact lens is placed on the eye for 3-4 days until the epithelium has recovered. Due to the introduction of the femtolaser, cases where laser procedures with epithelium removal should be preferred have become exceedingly rare.